We have an old dictionary on an old dictionary stand at work. I passed it today and noticed the call word on top of the page that the previous word-seeker had left open. I thought, “What a beautiful word!” and proceeded to read the definition. 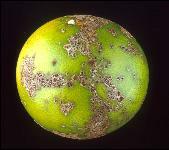 The above picture shows damage done by one of the species in the order myriangiales, called elsinoe fawcetti, or Citrus Scab. Even the picture’s kind of pretty from far away. "one of the species in the order myriangiales, called elsinoe fawcetti"
And the picture looks like an alien planet. Definitely a homeworld of the Royal House of Ascus - the Gel Planet. I am currently working my PhD on citrus scab. Unfortunately there are no enough literature on it, except very few from Florida University. Please send me any literature you find on this disease.